We again had a weird mix of factions with PanOceania out in force having six representatives compared to not one last year! 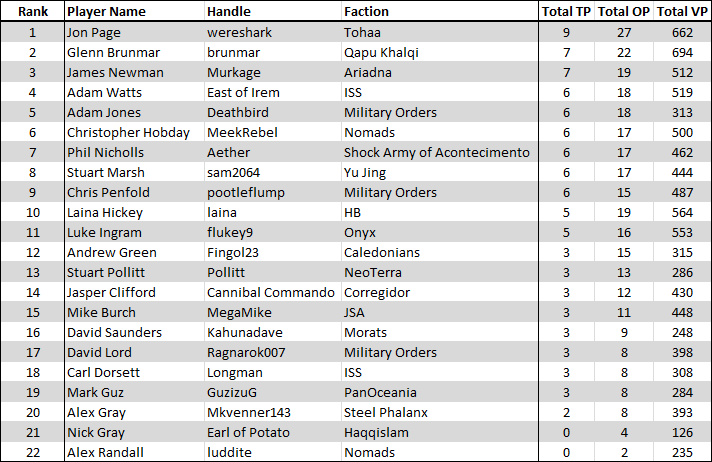 Whilst Yu Jing and Ariadna were still present with four and two players respectively it was a far cry from last year when those two factions made up over half the field between them. Our prize pool had kind donations from Corvus Belli, Micro Art Sudio and Simple Miniature Games and I think it ended up at a pretty decent size this year. Prizes were given out such that every player received at least one thing from the pool plus a patch and a badge. At the high end of the pool was the Scarface miniature, Guijia and a couple of hefty scenery packs. 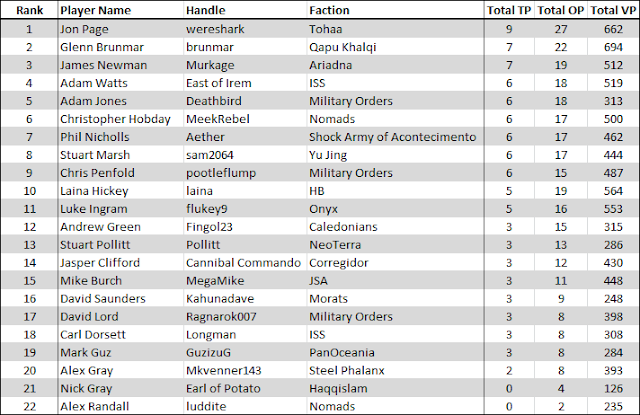 Players chose prizes in descending rank order with the exception of the painting prize which was first pick of the blisters and the wooden spoon prize which came with an Umbra Samaritan. There were a couple of unusual items in the prize pool as well including a limited edition Crane Agent and a PanOceanian RPG character from the Infinity RPG complete with signed art card by Gutier! Anyway, without further ado, let's see the results. So a big congratulations to Jon Page for taking the clear win on Saturday having scored a full three wins with his Tohaa. He was narrowly in the lead at the end of the second round (being only a single objective point ahead of the next three players!) but really pulled it out of the bag in round three in a grudge match with fellow club member Adam Watts. Shout outs also to James and Glenn who managed to secure 2nd and 3rd place despite playing each other in round 1 and scoring a draw. Also to Laina who unfortunately ended up in 10th despite having the best OP/VP tiebreakers of anyone outside the top two! Thank you to everyone who came down this year and hopefully I'll see you all again at the Expo on Saturday 2nd 2018! We also held a 'best army' competition over the lunch break for those taking part where everyone got to choose their 1st, 2nd and 3rd favourites (granting 3, 2 and 1 point respectively). We even had some Dropfleet Commander players pop by to vote! In the end it was David Saunders' Morat army that received the most votes. I think we had an excellent standard of tables to play on this year so my thanks go out to those who bought scenery with them on the day. As always the tournament couldn't happen without people generously bringing piles of buildings along with them! Our little corner of the hall was popular with visitors throughout the day who kept coming over to comment on how interesting all of the battlefields looked. We gave out a good chunk of quick start rules and had lots of chats with current and future Infinity players. Finally, there are a handful of mid-game shots that I managed to take. I really like the alien flora. I think it was paradiso sails in some kickstarter. Any idea where you can get it?